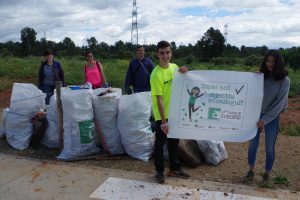 Terrassa participates in the awareness campaign on waste in natural spaces Let’s clean Up Europe! The program “Let’s Clean Up Europe!” is an action throughout Europe to raise awareness about the amount of waste that we uncontrollably run into nature and promote sensitization actions through the collection of these illegal waste in forests, beaches, river banks and others environments. In Terrassa, Secondary students from El Cingle and INS Can Roca have participated in the cleaning of natural spaces. The campaign is an initiative promoted by the European Commission that consists in the removal of waste during a day and with a playful and sensitizing objective. The INS Can Roca performed its activity on May 13, in a natural space between Torre-Sana and Torrebonica, and the school El Cingle did it on June 13 in an area around the field of the cemetery. The day is considered as a direct action to withdraw waste. As the participants advance on the route, they collect the remains found in their path and separate them by typology in order to facilitate their recycling. At the end of the day, young people calculate the volume of waste removed and weigh it. In the case of INS Can Roca, the activity was opened to the families of the center. Twenty participants collected during the morning a total of eight sacks of plastic and metal; two large sacks of waste; half large bag of glass bottles; two sofa cushions, one tire, two children’s car seats for the car and two paint pots. In 2017 the campaign had the participation of about 8,000 people in 199 actions that were carried out in 37 counties of Catalonia, most of which were focused on the most populated areas. In total, 75,602 kg of waste were collected.